Gavin Lee tap dances with four legs as Squidward Tentacles in SpongeBob SquarePants, with scenic and costume designs by David Zinn. BROADWAY SCENIC and costume designer David Zinn is a multifaceted wizard. With his burly beard and bushy handlebar moustache, he even resembles a crafty oracle who might hold the key to life’s biggest mysteries. What he holds in reality are two Tony Awards for his scenic designs — one in 2016 for The Humans and another for his majestic underwater world of Bikini Bottom in last year’s SpongeBob SquarePants. The two had never met but held deep admiration for each other’s work. Eventually, the show would include original tunes by some of the finest talent in contemporary music, but when Landau first spoke to Zinn, there was neither a book nor score. “Still, you don’t pass up an opportunity to work with Tina,” Zinn told Dramatics. Landau not only offered him the chance to design the set but also invited him to design the costumes, for which he received a Tony nomination. Costume design is where Zinn’s career began. Although he studied both set and costume design at New York University, his first job out of college was designing costumes for Target Margin, a Brooklyn theatre “founded on the principle that works of art return us to real truths more powerfully by their divergence from a strict illustration of reality.” It seemed a perfect fit for Zinn, whose naturally rebellious instincts have heavily influenced his creative eye. Paradoxically, Zinn’s illustration of the SpongeBob aesthetic diverged toward somewhat stricter realism, at least in terms of costume design. 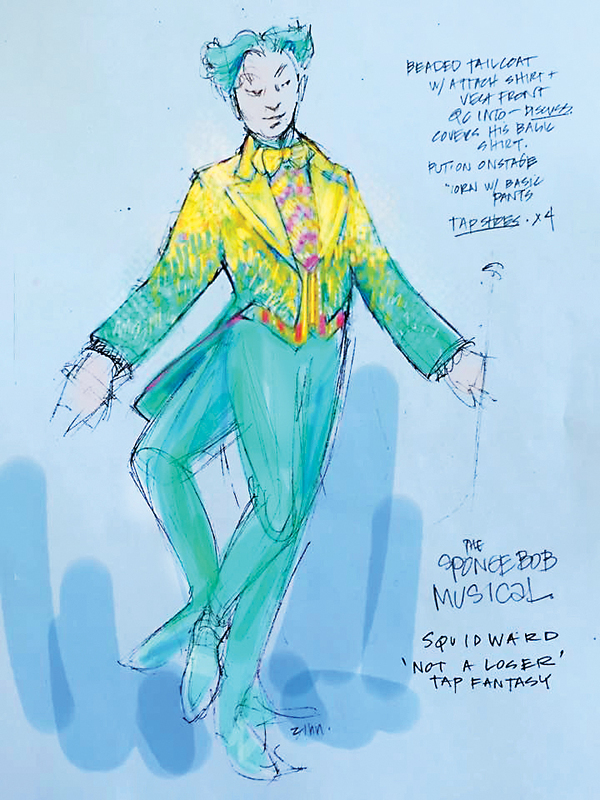 Zinn’s costuming evoked, rather than replicated, the aquatic cartoon, perhaps most subtly with the title character, whose square-ness is more figurative than physical in the Broadway adaptation. Often, cartoon characters who become “humanized” fall victim to large, bulky costumes, inhibitive to movement. Despite this streamlining, the overall integration of his dual costume and set design was hardly minimalistic. In fact, Zinn created nearly 200 eye-popping costumes for SpongeBob — and to listen to him, you’d think he’d never even broken a sweat. “Oh, that’s nothing,” he remarked, “The Cher Show has over 600, so we’re pretty small in comparison.” Small by Cher Show standards perhaps, but just as mighty. Zinn succeeded in making the well-known, two-dimensional cartoon characters spring to life. In the opening number, he adorned his ensemble in materials made from what he calls “a 99-cent store explosion.” Plastic tubes, bungee cords, hair-decoration necklaces, caution tape, plastic utensils, earplugs, and jersey mesh were a few of the materials incorporated into each costume. Zinn has explained that nearly every object, both on his creatures and on the set, was meant to be an item that had floated to the bottom of the sea. 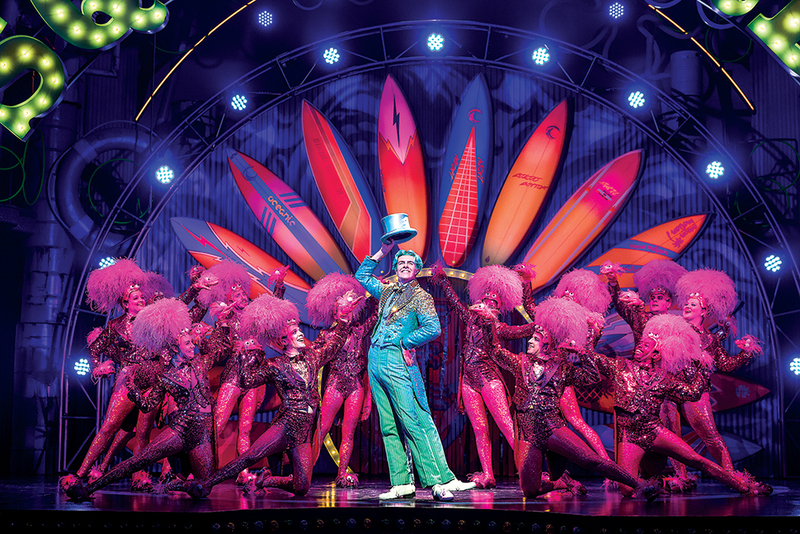 One of the more difficult costumes to design was for Gavin Lee, the Tony-nominated actor decked out in Zinn’s jewel-studded, sea-green tailcoat as Squidward Tentacles. After participating in a panel discussion at BroadwayCon in New York City’s Hilton Hotel, Lee spoke briefly to Dramatics about his elaborate ensemble. As a multi-limbed cephalopod, Lee faced his share of challenges. 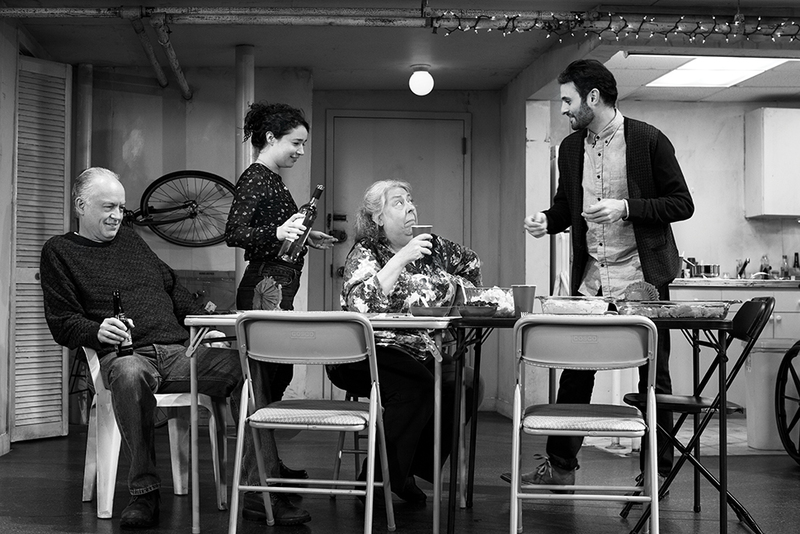 Zinn won his first Tony Award for Scenic Design in 2016 for The Humans, featuring Reed Birney, Sarah Steele, Jayne Houdyshell, and Arian Moayed. Photo by Brigitte Lacombe. Zinn was sensitive to the needs of the performers and worked closely with them to ensure the best costume representative of their characters. Lee had a lot of input into his squid garb, especially during Squidward’s show-stopping number “I’m Not a Loser,” in which he goes from a dowdy ne’er-do-well clad in a plain orange, zippered polo shirt to a fabulous, bedazzled song-and-dance man in mere seconds. Zinn received a Tony nomination in 2015 for his scenic design of the musical Fun Home. Photo by Joan Marcus. Zinn’s inspiration for these costumes first hit in the unlikeliest of places. “I had done the scenic design for a production of Hamlet at the Public Theater in 2017. One night, I was sitting in the back of the theatre, and my mind just started to wander. I opened my iPad and began sketching costumes for SpongeBob then and there.” That early framework provided the basis for his finished products, thanks in large part to a Shakespearean daydream. 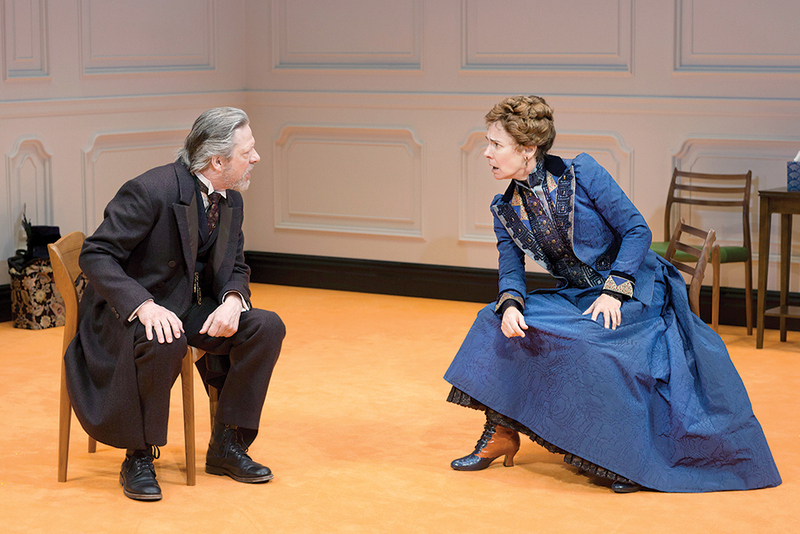 Zinn's costume design received a Tony nod in 2017 for A Doll's House, Part 2, starring Chris Cooper and Laurie Metcalf. Photo by Brigitte Lacombe. 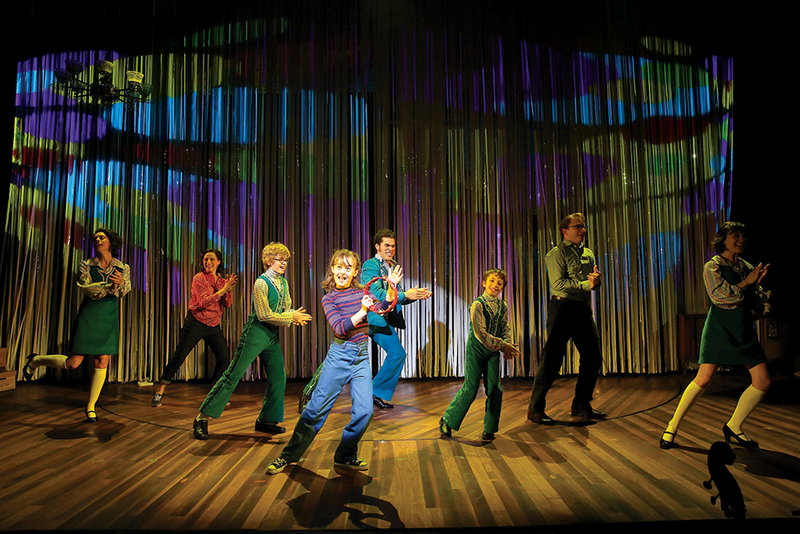 Lucky breaks are hardly a sure-fire recipe to being nominated for seven Tony Awards and clinching two. During our conversation, Zinn revealed useful tips to help aspiring designers. As he climbed the ranks toward Broadway, Zinn was well aware of his blind spots. “I was fortunate enough to be surrounded by people who were happy to help me,” Zinn said. “Plus, if I didn’t know something, I just learned it!” He honed his craft working on small projects in lesser-known theatres, and once his work got recognized, other successful artists tapped him to collaborate on projects. Above all, Zinn urged a can-do attitude. He isn’t afraid to dive headfirst into most projects and approaches all of them with eager confidence. “Nobody wants to work with someone who will say that a certain thing can’t be done. People want solution-oriented collaborators, someone who will just figure it out.” That industrious mindset may explain why his list of Broadway credits keeps growing. “This might sound a little obnoxious,” he said, “but my first two Broadway credits were for the musicals Xanadu  and A Tale of Two Cities . My first nomination came in 2010 for the play In the Next Room. Now, I look back and see that I have more than 20 Broadway credits under my belt and ask myself how it all happened,” Zinn said, a tone of genuine disbelief in his voice. This past Broadway season, his scenic designs were represented in Torch Song and The Waverly Gallery. He constructed both the sets and costumes for The Boys in the Band and Tarell Alvin McCraney’s Choir Boy. The day after his Dramatics interview, he headed to San Francisco’s American Conservatory Theater to create costumes and sets for Pam MacKinnon’s production of Edward Albee’s Seascape. Later this spring, his work will be seen in Ms. Blakk for President at Chicago’s Steppenwolf Theatre, where he’ll be reunited with SpongeBob director Tina Landau and playwright Tarell Alvin McCraney. Like Zinn’s own career trajectory — and the underwater world of Bikini Bottom — there is freedom and fluidity in carving one’s path.